Technology giant Apple launched the highly-anticipated iPhone 7 and iPhone 7 plus with advanced technologies like immersive stereo speakers and air pods and the new phones will be available to customers in India beginning October. While the iPhone 7 and iPhone 7 Plus will be available in more than 25 countries beginning September 16, it will be available to customers in India beginning October 7.
iPhone 7 and iPhone 7 Plus will be available in silver, gold, rose gold and the new black finish in 32GB, 128GB and 256GB models starting at USD 649 (US). iPhone 7 Plus will start at USD 769. Media reports are saying that in India the price of the latest iPhone will start at Rs 60,000 for 32 GB model. Apple yesterday unveiled two upgraded versions of its iconic iPhone, in a move aimed at capturing more consumers in an increasingly saturated global smartphone market. 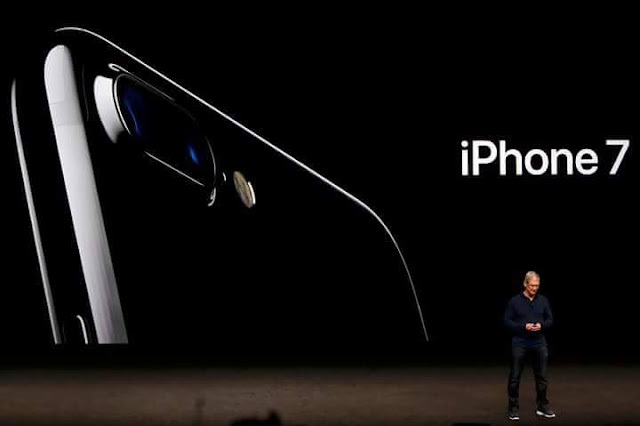 The iPhone 7 and iPhone 7 Plus, with new camera technology, water resistance and other features, were unveiled at a media event in San Francisco. Pre-orders for the iPhone 7 and 7 Plus begins from September 9 and the shipping will start from September 16 at first in 28 countries, with 30 more countries one week later.